^ 関 2011, p. 27. ^ a b 関 2011, p. 33. ^ 関 2011, p. 44. ^ Hannah Pakula (2009). The last empress: Madame Chiang Kai-Shek and the birth of modern China. Simon and Schuster. p. 346. ISBN 1-4391-4893-7. Retrieved June 28, 2010. ^ "General Marshall to President Truman", May 6,1946, Foreign Relations 01 the United States,1946 Vol IX, pp.815-18. ^ Jay Taylor (2009). The generalissimo: Chiang Kai-shek and the struggle for modern China, Volume 39. Harvard University Press. p. 402. ISBN 0-674-03338-8. http://books.google.com/books?id=03catqbPCmgC&pg=PA402&dq=chiang+portraits+streets&hl=en&ei=ZGCaTMfPPMP98AaCo9iTAQ&sa=X&oi=book_result&ct=result&resnum=8&ved=0CFEQ6AEwBzgK#v=onepage&q&f=false 2010年6月28日閲覧。. ^ Jonathan Fenby (2005). 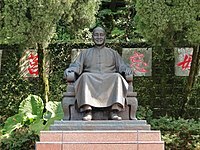 Chiang Kai Shek: China's Generalissimo and the Nation He Lost. Carroll & Graf Publishers. p. 337. ISBN 0-7867-1484-0. http://books.google.com/books?id=GTgEPrlfvG4C&pg=PA337&dq=chiang+portraits+streets&hl=en&ei=UGCaTKLlBsGB8gbyyeBX&sa=X&oi=book_result&ct=result&resnum=3&ved=0CDsQ6AEwAg#v=onepage&q=chiang%20portraits%20streets&f=false 2010年6月28日閲覧。. ^ Hannah Pakula (2009). The last empress: Madame Chiang Kai-shek and the birth of modern China. Simon and Schuster. p. 531. ISBN 1-4391-4893-7. http://books.google.com/books?id=4ZpVntUTZfkC&pg=PA39&dq=I+have+often+thought+that+i+am+the+most+clever+woman+that+ever+lived,+and+others+cannot+compare+with+me&cd=1#v=snippet&q=shanghai%20portraits&f=false 2010年6月28日閲覧。. ^ Laura Tyson Li (2007). Madame Chiang Kai-shek: China's Eternal First Lady. Grove Press. p. 448. ISBN 0-8021-4322-9. http://books.google.com/books?id=FRY0v7AH2ngC&pg=PA448&dq=chiang+portraits&hl=en&ei=P3CaTJOgLYL98Aapr8Rp&sa=X&oi=book_result&ct=result&resnum=1&ved=0CDEQ6AEwAA#v=onepage&q=chiang%20portraits&f=false 2010年6月28日閲覧。. ^ Stéphane A. Dudoignon, Hisao Komatsu, Yasushi Kosugi (2006). Intellectuals in the modern Islamic world: transmission, transformation, communication. Taylor & Francis. p. 134. ISBN 0-415-36835-9. http://books.google.com/books?id=MJzB6wrz6Q4C&pg=PA135&dq=china+jihad+japan+xue+chengda&hl=en&ei=Ny-VTPmSKML_lgfw-fCoCg&sa=X&oi=book_result&ct=result&resnum=1&ved=0CC4Q6AEwAA#v=snippet&q=jiang%20hadith%20jieshi%20leader&f=false 2010年6月28日閲覧。. ^ Hartford Seminary Foundation (1941). The Moslem World, Volumes 31–34. Hartford Seminary Foundation. p. 183. http://books.google.com/books?id=gIBCAAAAYAAJ&q=In+his+conversation+with+us+he+expressed+keen+interest+in+the+development+of+the+war+against+Japan+and+high+admiration+of+and+unwavering+loyalty+to+Generalissimo+Chiang+Kai-shek.+He+seemed+punctilious+in+his+religious+observances&dq=In+his+conversation+with+us+he+expressed+keen+interest+in+the+development+of+the+war+against+Japan+and+high+admiration+of+and+unwavering+loyalty+to+Generalissimo+Chiang+Kai-shek.+He+seemed+punctilious+in+his+religious+observances&hl=en&ei=XGXHTbeNIdDTgAf834zLBA&sa=X&oi=book_result&ct=result&resnum=2&ved=0CC4Q6AEwAQ 2011年5月8日閲覧。.